The new kid always gets the worst jobs. That's the way it would have seemed if you had wandered into the Sauber Mercedes pit garage on a bright winter's day at Paul Ricard in November 1989. One of the sportscar team's Group C Silver Arrows has clearly had an off and it is the job of a fresh-faced youngster to clean out the gravel that has found its way into every nook and cranny. Only something isn't quite as it seems. The lad wielding the vacuum cleaner is wearing Nomex, not to mention an expression of acute embarrassment. He's not Sauber's gofer, rather one of its latest influx of Junior racing drivers. The name on his overalls? Michael Schumacher. This is the first step in one of the most successful programmes ever designed to seek out young talent. The 20-year-old Schumacher is present in France along with fellow German Heinz-Harald Frentzen and Austria's Karl Wendlinger, two of his sparring partners from that year's German F3 series. Mercedes has secretly decided that it is on its way back to Formula One and so is aiming to prep this trio of German speakers for Grand Prix stardom via the defense of its World Sports Prototype Championship in 1990. The masterplan doesn't require Mercedes to be in Formula One until 1992 at the earliest, and only one of the three is in a hurry to get there. Schumacher, who finished behind Wendlinger and Frentzen in the German F3 title race, appears to have ignored his new team boss Peter Sauber's pep talk prior to their first run in one of that year's Sauber Mercedes C9s. "Peter made a speech in which he told us we were now factory drivers and we were to do as we were told," recalls Wendlinger. "Above all we were told not to crash." Not only was Schumacher "spinning all over the place", according to outgoing Sauber team manager Dave Price, but he contrived to get involved in a wheel-banging match with a Porsche 962C driven by Jo Winkelhock. The result was a trip through the gravel for the Sauber and a slap on the wrist for its driver. "When the 'kids' asked us how they were comparing with the other drivers we told them that we weren't timing them and that the whole point of the test was for them to get used to the car," recalls Bob Bell, who engineered the Junior drivers at Ricard. "When Schumacher went off we made him clean out the car." Bell says that Schumacher was the slowest of the three over the two days. "He spoiled it for himself," explains the Brit who moved with Price to Nissan's Group C team for 1990. "He wasn't so fast because he didn't get so many laps." Exactly who was fastest isn't clear 15 years on. Bell reckons that it was Wendlinger, though the notes that would confirm it are lost. Most of the other people involved in the programme believe it was Frentzen. Certainly the latter, who was 22 at the time, emerged fastest of the trio during subsequent tests at Ricard, Jerez and Hockenheim. These winter runs were designed specifically to prepare for a WSPC campaign during which the Juniors would take turns at the wheel of the second Team Sauber Mercedes car alongside Jochen Mass. The sportscar veteran, who would tutor the youngsters - and the architect of the Junior programme, Mercedes race director Jochen Neerpasch - rate Frentzen as the one who showed the most potential at this stage. "We clearly had three very good drivers," says Mass, "but it was Heinz-Harald who had the most obvious speed." Or at least it was the oldest of the three who got up to speed the quickest. "Frentzen would be the one who was on the pace straight away, then Schumacher and then Wendlinger," explains Neerpasch. "Heinz-Harald clearly had a lot of natural talent. I wouldn't say he didn't take it seriously, but it seemed easier for him. Michael had to work at it - and so he did. He was more systematic and more analytical." Schumacher's burning desire to make himself and his car ever faster, a cornerstone of his record-breaking F1 career, became evident in his maiden sportscar season, in which he contested three races in that year's Mercedes C11. A fourth, his scheduled debut at Silverstone, turned out to be a false start when he was disqualified in practice for receiving assistance beyond the pitlane. Mass: "He was constantly asking questions and always thinking about how he could change the car. I was in charge of its set-up and often had to tell him to leave things alone." Neerpasch calls the Schumacher of 1990 vintage - a driver in only his third season of car racing - a "rough diamond". It was his desire for self-improvement that allowed him to quickly polish up his skills. "He was like a baby," says Neerpasch. "By that I mean he had a baby's ability to learn. He learnt in one year what other people learn in three or four years, and not only technically." 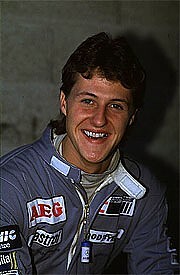 Even before the end of the 1990 season, Schumacher was emerging as the standout among the three. "We thought Michael was the one over the winter, but he confirmed it during the season," Neerpasch says. "We realised that he was much more than a very good driver, that he was something outstanding." That much was evident from the outside, too. It was Schumacher who made the biggest impression, even though Wendlinger achieved almost identical results alongside Mass. Frentzen, meanwhile, was in the process of ducking out of the Mercedes Junior programme. First, he had opted to concentrate on his debut season in Formula 3000 with Eddie Jordan and found time to take in just one WSPC round. Then he quit altogether to focus full-time on single-seaters for 1991. Wendlinger contested three of the opening four races courtesy of greater flexibility in his single-seater programme; he was undertaking a handful of F3000 outings with his manager Helmut Marko's squad, while Schumacher was mounting a successful bid to emulate his new team-mate by winning the German F3 title. So Wendlinger has already notched up two runner-up places behind Sauber's lead entry driven by the reigning champions, Jean-Louis Schlesser and Mauro Baldi, and had also scored a fortuitous victory at Spa-Francorchamps by the time Schumacher's sportscar career began in earnest at Dijon in July. The future superstar took over from Mass in second place behind Baldi and cut a 16sec lead in half over the course of his stint. What's more, he also brought the car back onto its fuel schedule. Group C, remember, was still at this stage a fuel formula, with a fixed allocation of gas for each car. 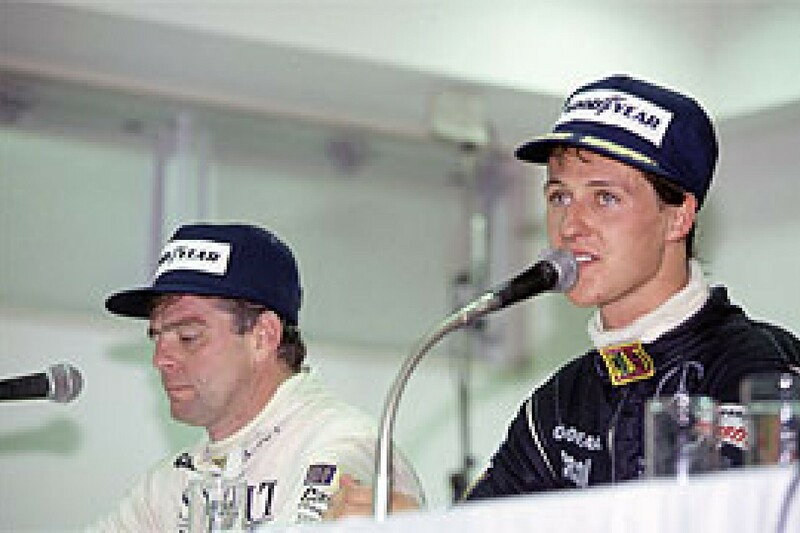 Schumacher impressed again at the Nurburgring and then in the rain at the season finale in Mexico City. This race gave him the first of his two world championship sportscar wins, though he was even more fortunate to gain full points than Wendlinger had been at Spa. The victory came some time after the race had finished, when Schlesser/Baldi were disqualified for having been given too much fuel. Direct comparison between the three - Schumacher, Wendlinger, and Frentzen - isn't easy because they never drove together at the races. But the following season the first two teamed up in Mercedes' stab at the new 3.5-litre atmo GpC regs during the renamed Sportscar World Championship. This time any comparison is made difficult because the C291 was no match for Jaguar's XJR-14 or the evo version of Peugeot's 905 that appeared mid-season; nor was it reliable, its complex flat-12 plagued by electronic and machining problems. Wendlinger insists he was on a par with Schumacher in 1991: "We took qualifying in turns, so it was not easy to say who was fastest. 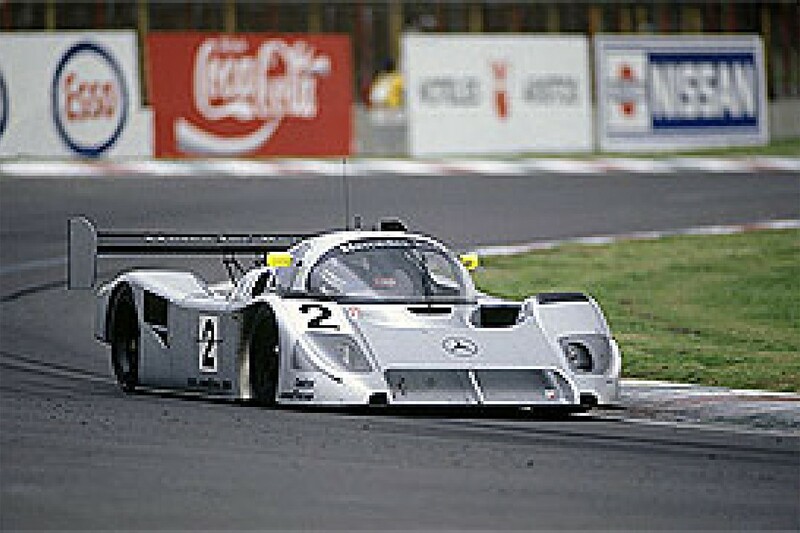 But, for example, at Autopolis [a race Schumacher/Wendlinger won] was his turn to qualify. He set the time, but I also got a set of tyres and ended only five- or six-hundredths behind him. He was not unreachable at that time." Wendlinger maintains, too, that in 1990 and '91 the world had yet to see the ultimate Schumacher. "If you look at his career he has kept on improving," he explains. "In his first year at Benetton in '92 he was good, but nothing special. He was better the following year, and then clearly took a big step forward in his own performance during the '94 season. That has been the key to his success; he's kept on improving." One incident during the 1991 season gave the world a taste of a different side of Schumacher, the man who would gain infamy for his sideswipes at Damon Hill and Jacques Villeneuve in the F1 finales of 1994 and '97. This time his 'victim' was Jaguar's Derek Warwick, and the 'scene of the crime' was the Nurburgring's SWC meet in August. "I knew Michael was on quallies and saw him coming and moved over, putting nearly the whole of the car on the kerbs," says the Briton. "I made it look as though I was getting out of the way, but I knew it would screw his lap." What happened next was a "total over-reaction", according to Warwick. "He cut straight across me and took my nose off." Both cars came into the pits and an incensed Warwick jumped from his Jaguar and chased Schumacher out of Sauber's pit and through one of its trucks before cornering him in the back of the second transporter. "I remember holding him down over what I think was a massage table, with Mass trying to pull us apart and Schlesser yelling, 'Hit him, Derek, hit him!'" Little did Warwick know that a well-aimed punch could have prevented one of the most memorable Grand Prix debuts in recent history. For few knew that discussions were already under way to make Schumacher an F1 driver in time for the following weekend's Belgian Grand Prix. And the young man who arrived at Spa to drive the Jordan vacated by the imprisoned Bertrand Gachot was more than qualified for the job. Jordan team manager Trevor Foster, who also engineered the newcomer that weekend, reckons his two seasons with Mercedes had been the perfect stepping-stone: "It was a phenomenal grounding. He knew how to work with a big team and how to get it working for him. What's more, those Group C cars were capable of lap times not too dissimilar to an F1 car, and he had gained experience of running on qualifying tyres, too." A driver whose F1 experience stretched to a little over two dozen laps of the Silverstone South circuit prior to arriving at a track he didn't know ended up outqualifying teammate and Spa specialist Andrea de Cesaris. Seventh-fastest made the establishment take notice, even though he cooked his clutch and only got as far as Eau Rouge in the race. "We could tell he was special," says Foster. "A real talent." That was something all at Sauber and Mercedes already knew.